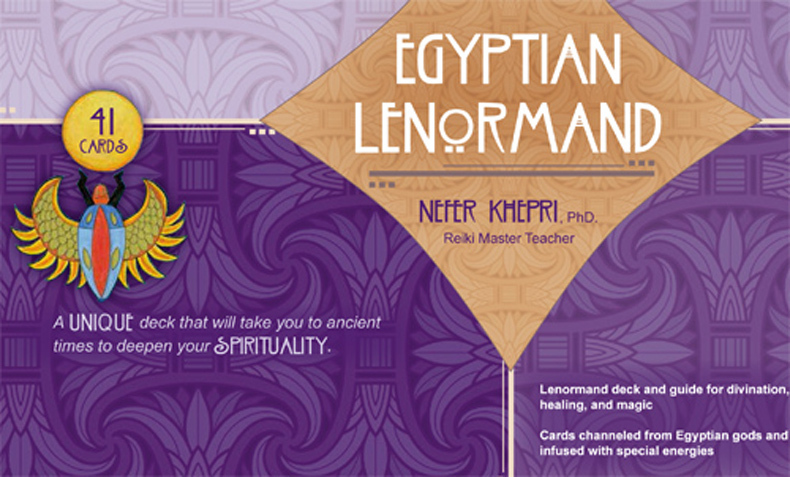 The Egyptian Lenormand, by Nefer Khepri. Copyright Schiffer Books & NK, 2015. Since Schiffer Books published my Egyptian Lenormand card & book set I am now being asked these questions often on Facebook, Twitter, & email so thought I’d answer them all here in this post for everyone’s convenience. If you have a question & you don’t see the answer here, please email me at IsisRaAnpu@gmail.com. Q: What’s this I hear about “activation” of your deck? Is that something I can do myself? 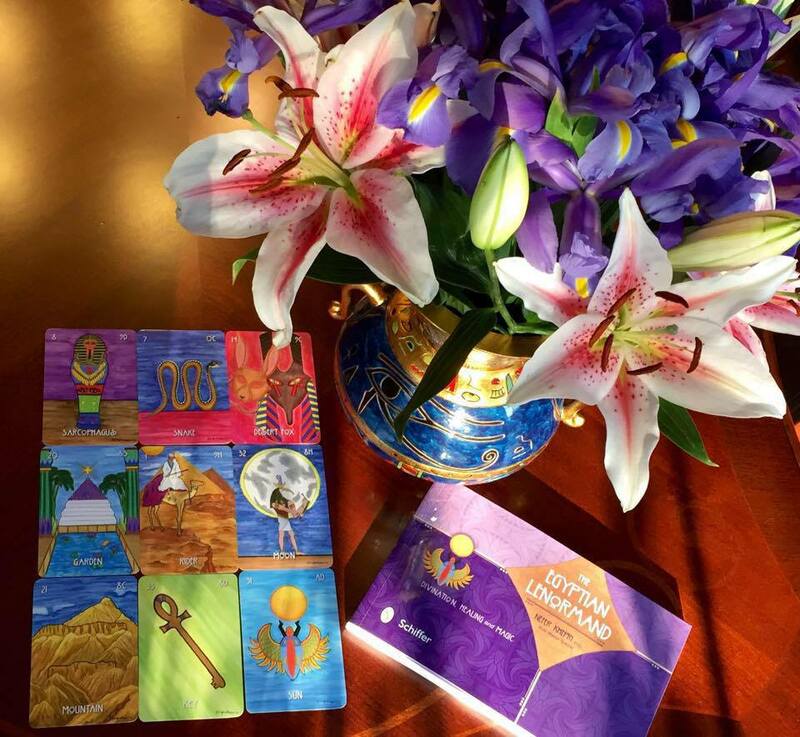 A: My Lenormand is different from any other in that the images were channeled directly from the Egyptian deities with Whom I have been working for the past 2 decades. They wished for “their” system to be used not just as a Lenormand deck, but also for healing and magic. They placed specific energies into each image, but those energies must be activated via a ceremony for which all instructions are included in the accompanying guidebook. YES, you CAN do this for yourself! Once activated the deck goes beyond fortunetelling & becomes a valuable tool for healing & magical work. Q: Why didn’t the self-published edition come with the 2 extra Activation cards that the Schiffer edition has? A: The gods had other plans at the time. Although they did share some of the information with me when I first created the deck, they did not explain the entire process to me. They told me the full explanation would come “later.” Of course they are all-knowing so they KNEW that a major publisher would pick up my deck. I was unaware of that at the time. Once I signed my contract with Schiffer the gods then provided me with all the information needed in order to activate the deck and how it is meant to be used for healing (there’s a specific method detailed in the accompanying guidebook). Q: Can I get you to activate a copy for me? A: Most definitely. I sell signed AND activated copies through my deck’s official website; however, I also recommend to all who purchase a copy that they also take their deck through the Activation Ceremony as it is explained in the accompanying guidebook. That will then succeed in placing your own unique energy into your personal copy of the deck. I have had quite a few people now report back to me that after they purchased from Amazon & elsewhere they began using the deck right away for readings & were amazed, but that after they took their copy through the Activation Ceremony the deck became even more useful to them as readings became more accurate and much easier for them to interpret. When I activate your deck for you I also give it a Reiki Master attunement as well, since I am a master teacher & able to pass attunements. A: Yes, I do, via Priority in the continental USA (excluding Alaska & Hawaii) and via 1st Class Air to everywhere else (including Alaska & Hawaii). I have 2 payment links at the website, so just use the one appropriate for your area of the world. Q: Why does a deck from you cost so much more than Amazon? A: Firstly, Amazon will undercut everyone regardless because they buy titles in massive bulk. When you order in bulk direct from the publisher, as Amazon does, they are pretty much given wholesale prices. Amazon can then afford to sell items cheaper than anyone else. Secondly, a deck from me costs more ($40, plus shipping) because I take the time to perform the full Activation Ceremony for your copy & give your copy a Reiki attunement. That requires my time & energy which is included in the $40 price tag. Q: Where can I purchase a copy of The Egyptian Lenormand? The Egyptian Lenormand, box lid. A: The Egyptian Lenormand is available at most Amazon sites worldwide & at my publisher’s website, SchifferBooks.com. I have also seen it carried by BookDepository.com (they ship worldwide for free), Walmart, Target, BooksAMillion, and online at Barnes & Noble. You can also ask your local new age shop to carry it & the owners can order from New Leaf Book Distributors. Q: Do you have any other decks for sale? Q: Are you working on any other decks? A: Oh, yes I am! Several, in fact. All at once because that’s how us Geminis roll! You can follow the progress of my first pictorial deck, which will also be my first oracle deck, at its own group on Facebook. This deck is called “The Aloha Spirit of Maui” and is based upon nearly 4,000 photographs I took myself on 3 separate vacations to Maui, Hawaii undertaken in 2009, 2011, & 2014. I plan to self-publish this deck sometime in early 2016 & it will consist of 44 cards. This deck also has its own blog that I plan to continue posting to now that I have other obligations taken care of & you can find it here. Serapis Bey, for Meagan. 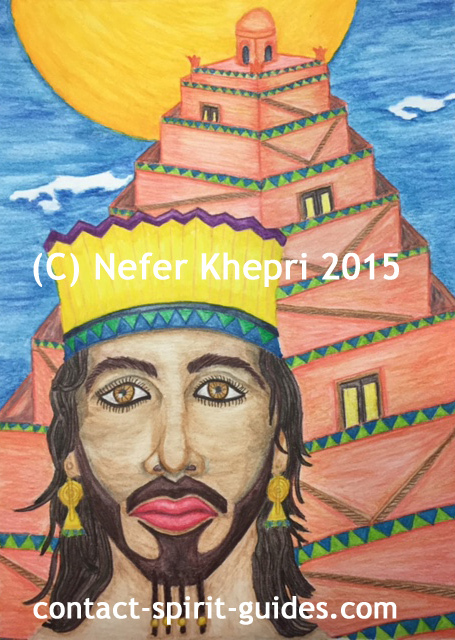 Copyright Nefer Khepri, 2015. If you’d like to keep up on a deck I’m creating of Spirit Guide Portraits you can do so at my other Facebook group: The Visionary Art of Nefer Khepri. I have no idea when this deck will be complete. All images are channeled from a wide variety of spirit guides so they come through when they come through & when there are orders to fill. To order your own Spirit Guide Portrait, I am creating a NEW site, which is nearly complete. Portrait size is 9×12″ with the actual image being 8×11″ & they sell for $120 plus shipping. If anyone would like one sooner rather than later, let me know & I can send you a PayPal invoice as I have been accepting orders for a while now, but the site itself will be ready in the coming weeks. You can keep an eye on its development at http://contact-spirit-guides.com, but please note there are no payment links posted as of yet & I’m still working on the organization of the site. 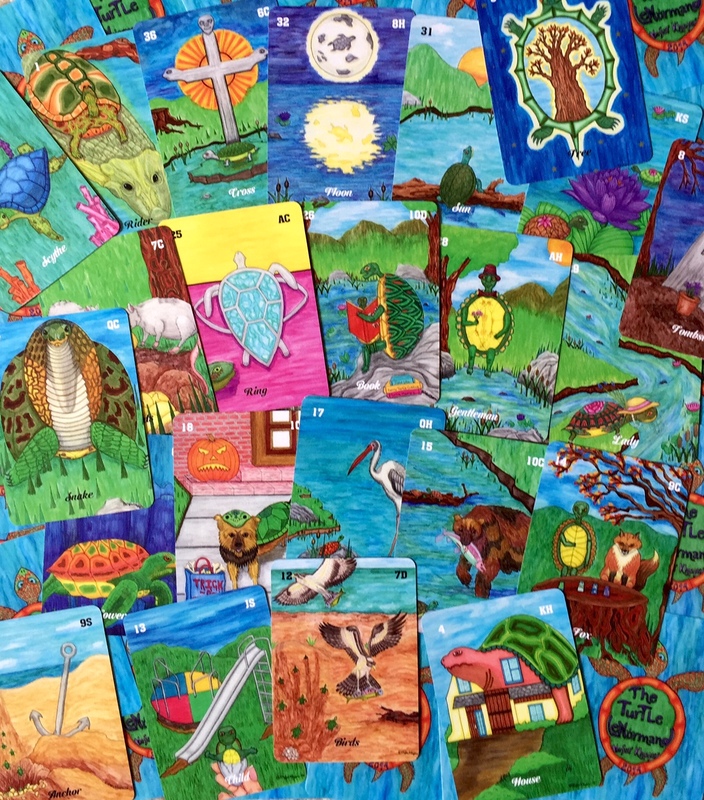 I am also working on TWO tarot decks, one of which you can also keep up with in my Visionary Art group (link is above), but my other tarot deck is TOP SECRET. I have no projected completion dates as of yet for either of these projects, but for one deck I have 17 completed images already & for the other I have 14 images drawn & ready to paint. Feel free to ask me questions & perhaps you will see your question included in a future blog post.